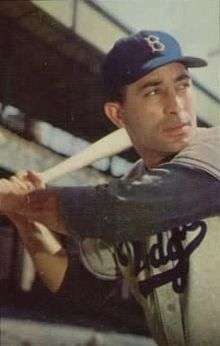 Furillo played in seven World Series with the Dodgers, six of them against the New York Yankees, winning in 1955 and in 1959 against the Chicago White Sox. He had an excellent 1947 World Series, batting .353 in a seven-game loss; he had two RBI and scored a run in a 9–8 Game 3 victory, and scored the run which gave Brooklyn the lead for good in an 8–6 win in Game 6. He preserved a 6–5 victory in Game 5 of the 1952 World Series when he made a spectacular catch over the fence of an apparent home run by Johnny Mize – who had already homered three times in the Series – with one out in the eleventh inning. In the 1953 World Series he hit .333, and drove in the tying run in the seventh inning of Game 1, though Brooklyn went on to lose; in the final Game 6, his 2-run homer with one out in the ninth tied the game 3–3, but New York scored in the bottom of the inning to win the game and the Series. In the victorious 1955 Series he started the scoring with a solo home run in his first at bat of Game 1, which New York won 6–5. In Game 7 he advanced Roy Campanella to third base on a groundout in the fourth inning, with Campanella later scoring, and was walked intentionally with one out and runners on second and third in the sixth, with another run following on a sacrifice fly by Hodges. The two runs held up for a 2–0 victory, and Brooklyn earned the first World Series title in franchise history. In the 1959 Series he was limited to four pinch-hitting appearances and his 2-run single in the seventh inning of Game 3 broke a scoreless tie. Los Angeles held on for a 3–1 win. After retiring, Furillo left the sport for good. While writing his 1972 book The Boys of Summer about the 1952 and 1953 pennant-winning teams, author Roger Kahn located Furillo installing elevators at the World Trade Center. During the mid-1960s, he owned and operated a deli in Flushing, Queens. Furillo later worked as a night watchman; he developed leukemia, and died in Stony Creek Mills, Pennsylvania at 66 years of age of an apparent heart attack. Furillo felt that baseball completely forgot about him and his accomplishments. He is interred at Forest Hills Memorial Park in Reiffton, Pennsylvania. ↑ "Can Rivals' Hatred Become Teammates' Amity? It's Happened". The New York Times. 17 February 2013. Retrieved 11 August 2016.